Find the right word wherever you go. 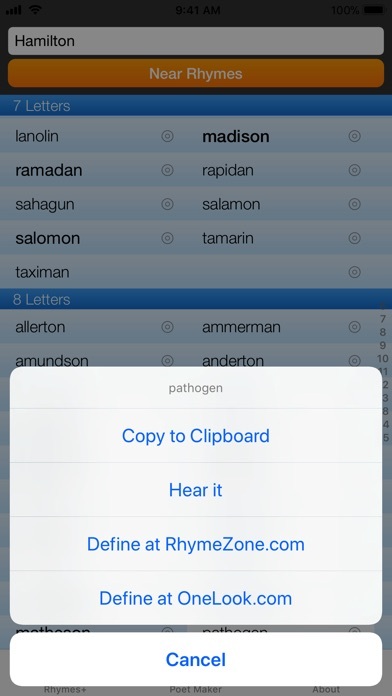 The official RhymeZone iOS app is a fast, powerful rhyming dictionary and thesaurus that you can use anywhere, even if you're not on the net. Quickly find rhymes, near rhymes, synonyms, antonyms, homophones, similar sounding words, words with the same consonant pattern, and other related words (generalizations, specializations, words appearing in the same context). You get a database of way over 100,000 words and phrases right at your fingertips. 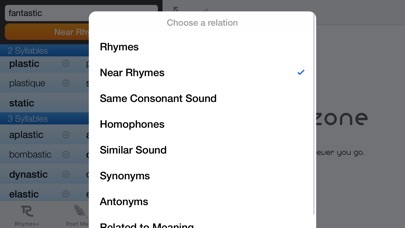 Find rhymes without an internet connection, but if you are on the net when you use the app, it can connect you to RhymeZone.com for definitions and all the other great features you've come to love. Or you can look it up on our sister site, OneLook.com, or even hear it pronounced with your device's built-in text-to-speech. There's also a nifty "Poet Maker" feature, which lets you find words that match constraints on both rhyme and meaning at the same time. For example, suppose you want a word that rhymes with "cat" and means "heavy"; this feature will answer "fat" in no time. 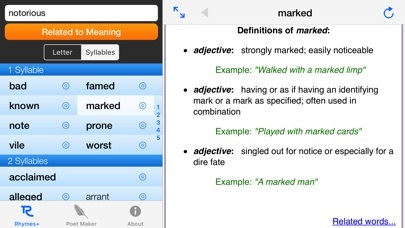 Or suppose you're looking for a rhyme of "curious" that means "invalid"; you'll get "spurious". You get the idea! This feature is experimental; registered users of the app will get free upgrades as they become available. So whether you're looking to put on the finishing touches of a love poem, bust out the next rap lyric, or just seeking some clever wordplay for your English assignment, give the app a try! This app has really helped my songwriting process. I like the ease of use. Well done! 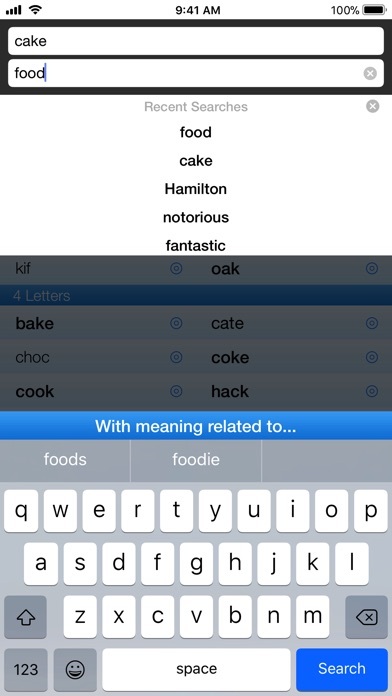 I’ve been using the online version heavily and now that there’s an app it makes searching words quick and easy. Thanks!!!!!!!! Why is that the free version webpage have most of the rhymes that i looked up but the app version i paid for doesn't have the same words i looked up ? Strange right ? 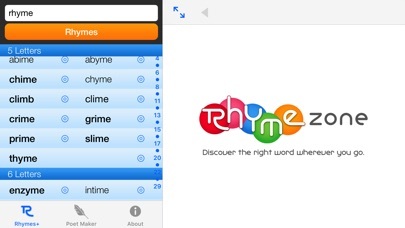 RhymeZone is my go-to app AND my go-to site for a quick rhyme, a synonym, or other word needs. I love that I can get the most common rhymes right off the app but when I need something less quotidian there is a link to the website that gives me more than I need! Not ideal for mobile. Older, simpler UI on web was better so that’s what I use.